There are a number of ways to adorn the mala with a pendent. The one shown here involves threading the flowers from the side to form a line. Then, for variety, I add a large peony from my garden. If I had more types of flowers in the mala, I might include them in the pendent or ball. Then I take the two ends and tie them together, bringing the flowers together tightly to form a ball. You need to be careful not to tie too tightly as you can pull the tread clear through the flower and cause it to fall off! 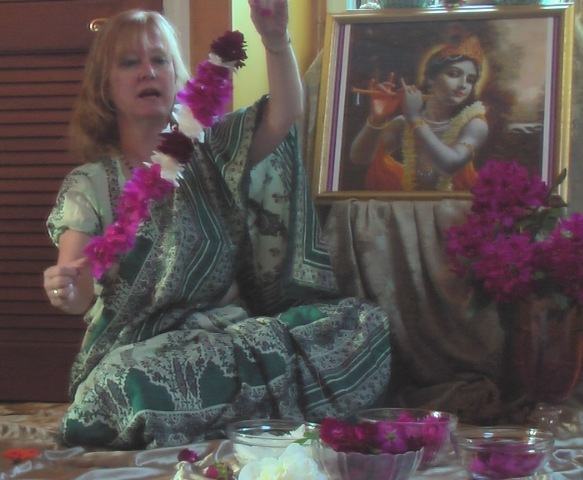 Tie the ball to an area in the center of the mala. Cut off any excess thread which might be sticking out from the mala. This is the ball closeup. You can see how the azaleas are stitched through the side in this view. 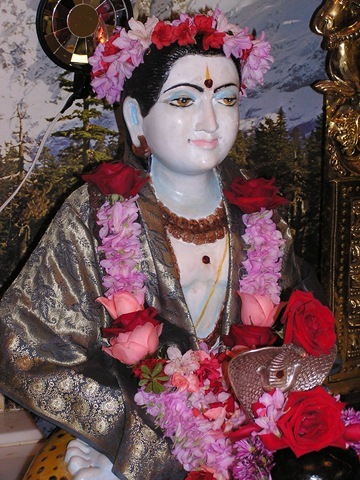 flower head is showing in all different directions to make the mala look full. 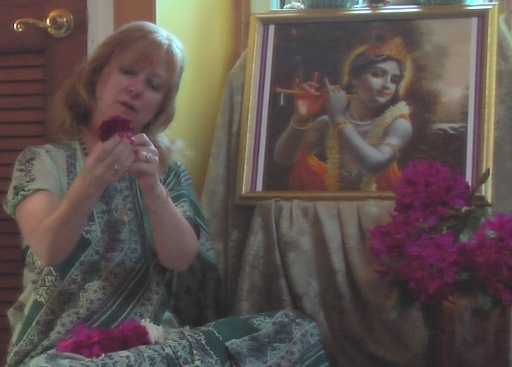 Within a few months of starting to attend puja, I found myself drawn to the music and the malas! It was not long before I began to pick up the needle to begin stitching and the notes to begin singing. 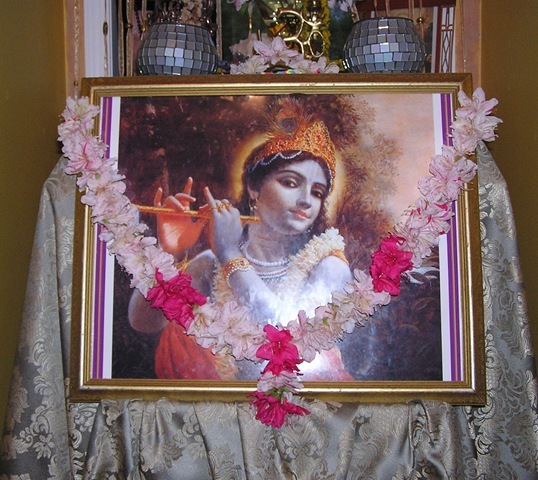 There are many ways to express devotion to the limitless Self and I tend to be simple in my approach to it. I would much rather make a mala than analyze the nature of reality!!! 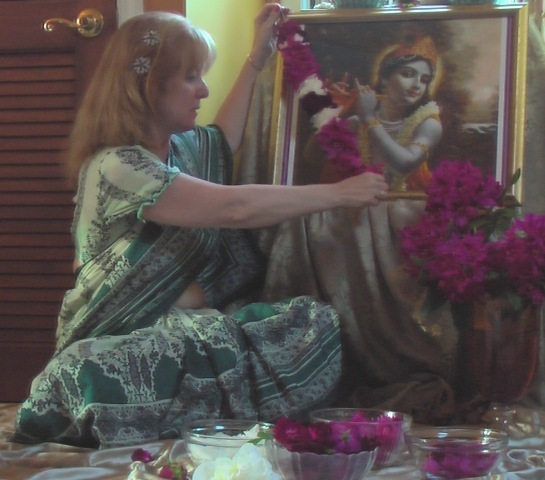 And I would much rather sing the mantra than write a manuscript interpreting it. 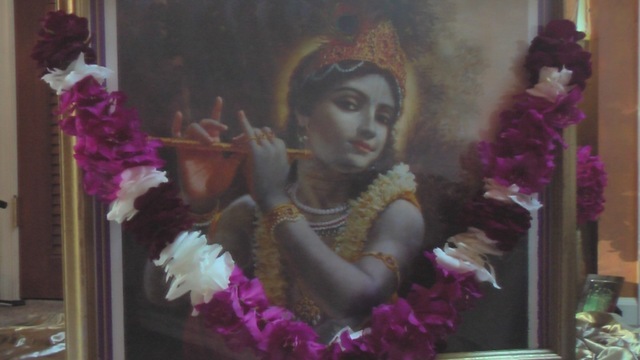 To me, everything is Brahman and I have little interest in deciding what level of Brahman it is…I embrace it all as such and leave it to the Grace of the Lord to direct my footsteps. 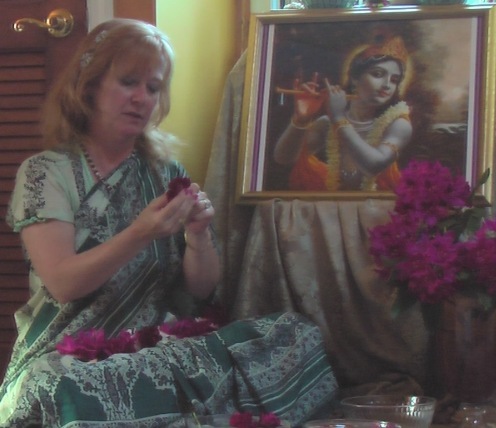 The videos on making malas or garlands in the links posted at the end of this article are a deviation from my usual music videos. 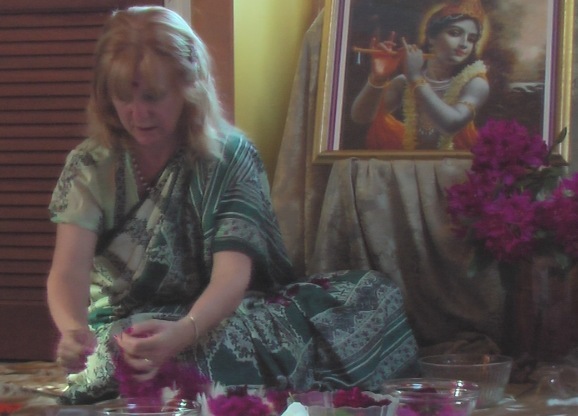 Still, they are grounded in devotion and my effort to share what I have learned over the last six years making malas for Rudrabishekam and other holidays. I have also taken to making them at home and that is what led me to share. 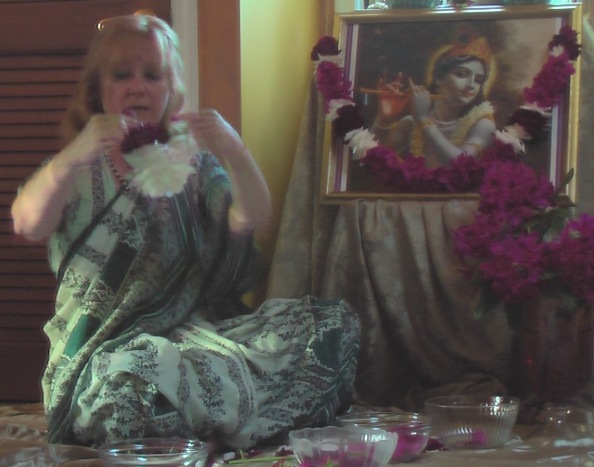 I have been asked by others at Temple how to make garlands, and there never is enough time during puja to share this. Plus, one does not talk while Panditji is chanting the puja. 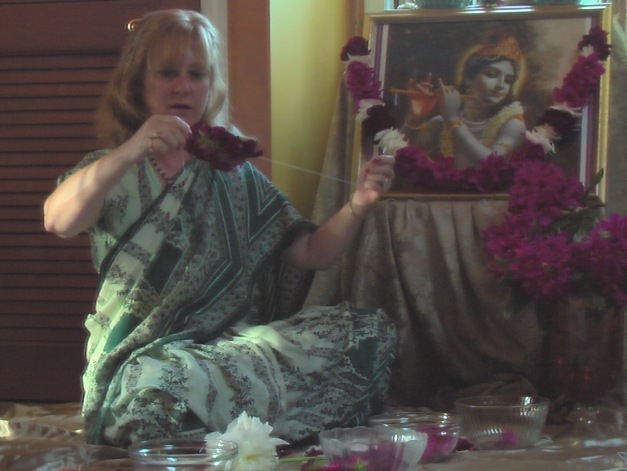 So, I decided that I could make a home video of making malas at home. 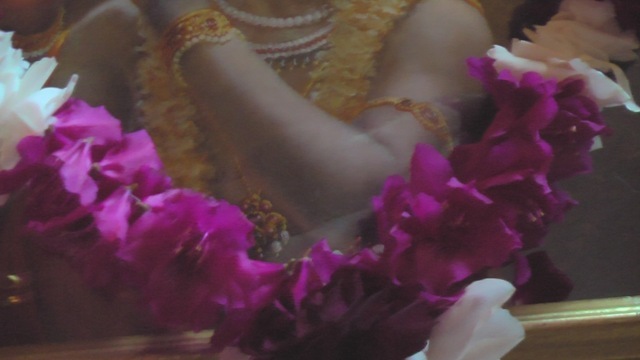 When you make a mala, you need to take the time to assess the flowers you have to work with. And you need to asses the amount of time you have to make the mala. 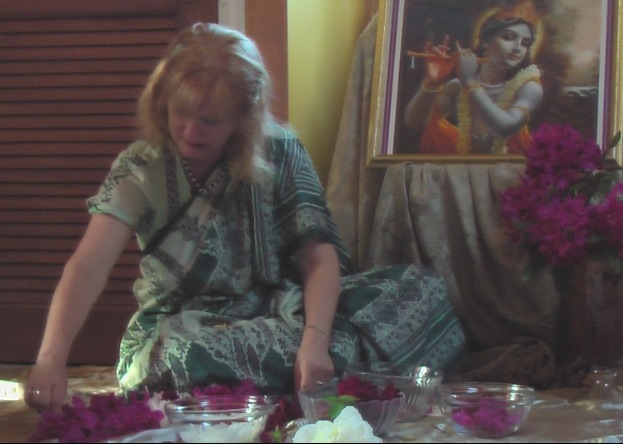 Sometimes I have help…sometimes there are not enough flowers to allow too many for the malas, as you need to reserve some of the flowers for the puja. Summer is good, when gardens are flowing, including the ones on the Temple grounds which are slowly becoming more and more lush with perennials. But the real challenge is when there are limited flowers to work with. One afternoon on Mahashivarati, when there were plenty of flowers, I spent well over an hour making two malas, using both intact flowers and petals to provide interest, contrast, and to connect the flowers and hide the green buds that day. 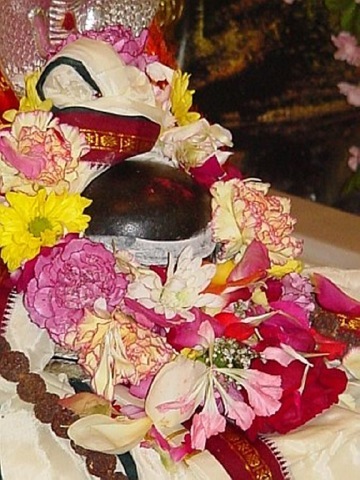 You can see it on Lord Shiva below and on the linga beneath Him. Most of the time, I have to make three in less than an hour. So, I have to quickly assess the flowers coming in and include them as I can. Sometimes, I make a mala with multicolored flowers, staggered throughout the malas in a cascade of colors. Sometimes, I will choose only a few colors (sometimes I only have a few colors) and use them as my pattern. Variation in size of the flowers also provides for interest and beauty, as in the mala below. It has spring flowers from my garden in it…violets, vinca, bluebells, a daffodil, and the really small purple sections which almost look like beads came from grape hyacinths. I do not even know what all of the flowers are as the orange ones come from some bush which was already on the property and the yellow ones, I just don’t remember what they are called. Then the azaleas came into bloom, and the one below shows what you can do with that. the bottom through the top of the flowers to form a tassel. 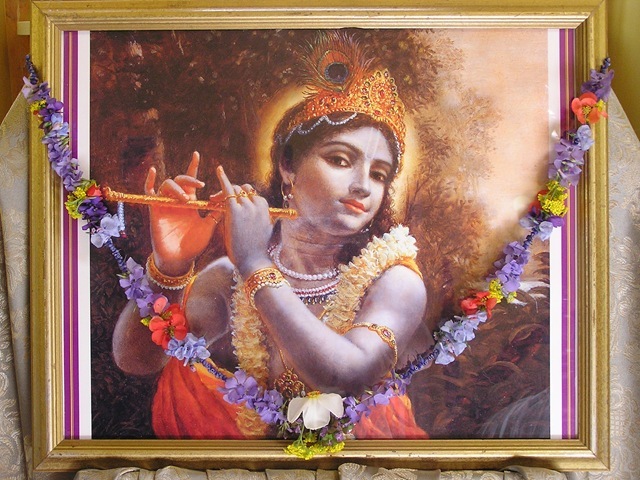 The photographs of Lord Shiva were taken by Bharatji, our unofficial temple photographer. You can see that I included the azaleas as well as roses someone brought in that evening. the azaleas are stitched sideways and the roses are stitched upright. This provides a beauty in variation of the direction of the flowers. I only made the mala shown on Lord Shiva’s chest. 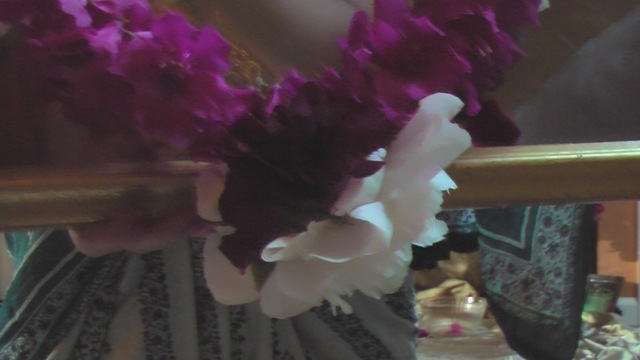 Someone else helped with malas that night and made the one crowning His head.